Our family loves The Children’s Museum of Atlanta. 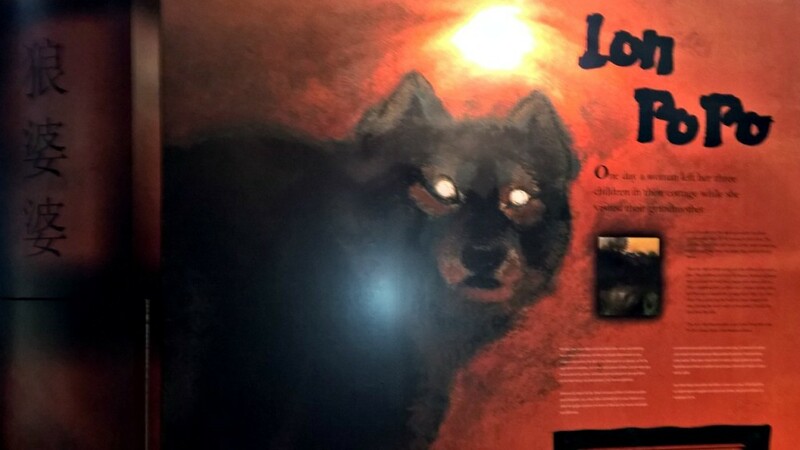 It’s always worth a trip into the city to spend a few hours at this fun locale, but this summer they’re offering a fairy-tale exhibit that will no doubt appeal to literary buffs of all ages–like me! “Once Upon a Time” is a hands-on, educational exhibit that brings the magic of fairy tales to life. 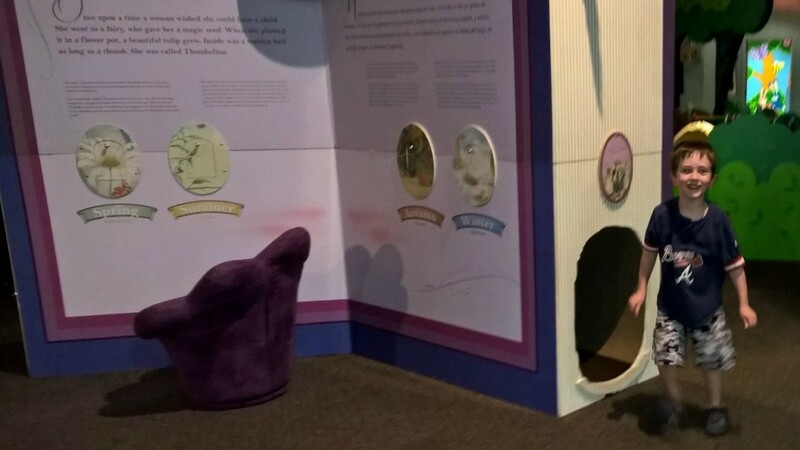 Featuring colorful, gorgeously illustrated giant books that children literally walk, crawl or slide through, all of the exhibit’s scenes are culled from seven of the world’s most famous fairy tales: Beauty and the Beast, Cinderella, The Elves and the Shoemaker, Jack and the Beanstalk, Thumbelina, Anasi and the Talking Melon and Lon Po Po. Without giving too much away, here are some highlights from my son Jonah’s trip through this larger-than-life library. Cinderella’s carriage was a huge hit with all the kids. The seats bounce up and down with a delightful banging sound, and a video plays in the window to make it appear that you’re riding through the countryside. And there’s a chest nearby full of royal crowns and costumes to add authenticity to the experience. 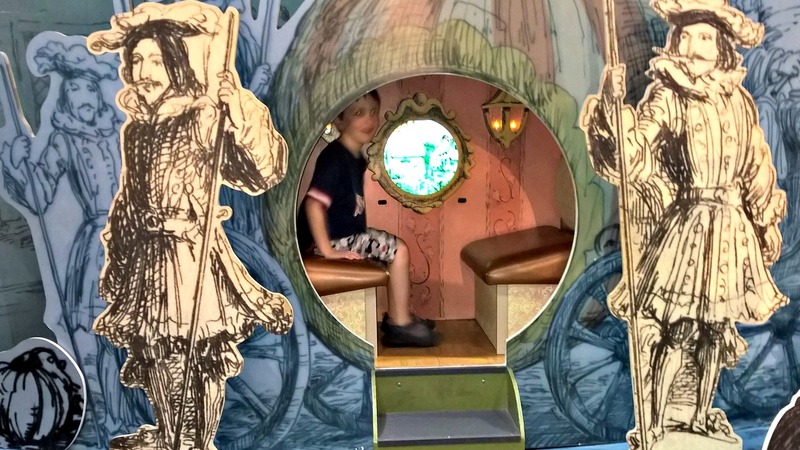 The simple tunnel through “Thumbelina” was one of Jonah’s favorites. He scurried in and out like a little mouse over and over again. With kids, it’s often the simple things, isn’t it? 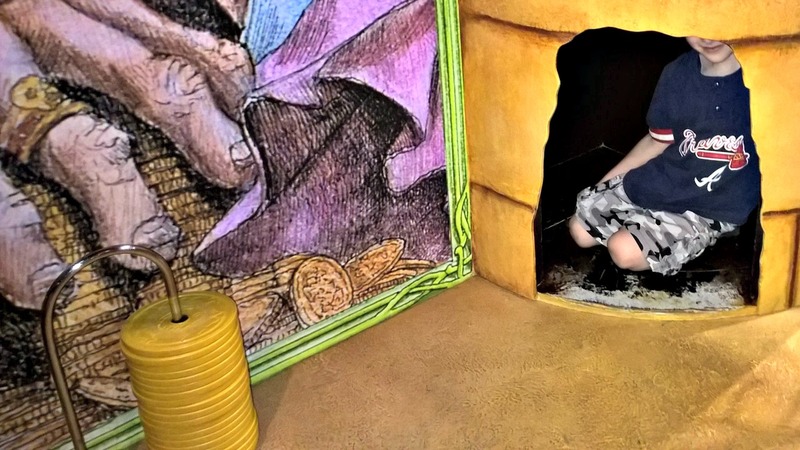 “Once Upon a Time” is full of little hiding places, such as this little cove tucked under the “Jack and the Beanstalk” slide. 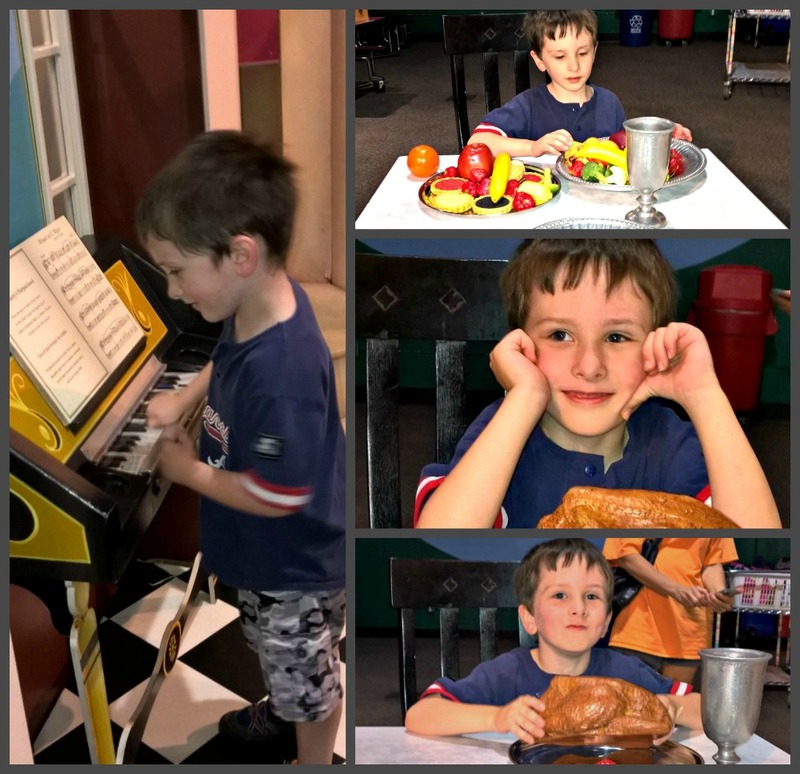 Next, we stepped over into Beauty and the Beast, where Jonah entertained us on Belle’s harpsichord and the two of us sat down to a feast served on real pewter dishes. Other kids seemed amused that an adult had sat down, and they all started “waiting” on me, pouring pretend drinks and calling me “M’lady”. I think I had more fun than the kids! Other storybook fun included creating our own fairy tale on a computer, finding hidden fairies and raising the wolf from Lon Po Po up and down in his basket. 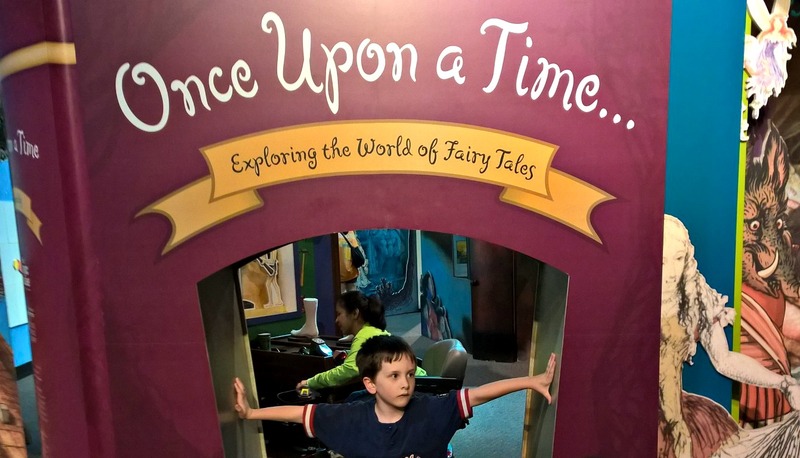 “Once Upon a Time” runs through July 26th, and though the museum is usually closed on Wednesdays, it’s open seven days a week through summer break. My only advice for visiting on a weekday is to come after noon. Though they close at 4:00, (5:00 on Saturday and Sunday) even arriving as late as 1:00 will give you plenty of time to enjoy all the attractions without all the heavy crowds that sometimes appear at their 10:00 opening time. We arrived a little before 11:00 to find several day care and school groups already there. My son has some sensory issues, and after an hour or so, had a major meltdown from people overload. (I don’t have sensory issues, and it was almost too much for me, too.) I should note that the museum provides several “quiet zones” for kids to decompress, and if sound sensitivity is a problem, the vending machine room is virtually soundproof. By 1:30, the crowd had substantially diminished. 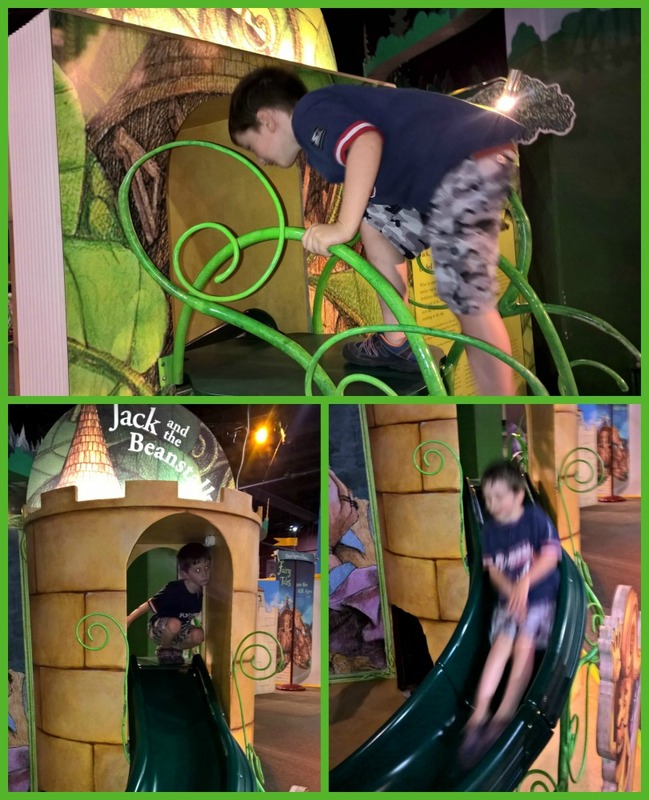 That’s when the fun kicked in again and we enjoyed all our favorite permanent exhibits, such as the sandbox, treehouse and the crane. 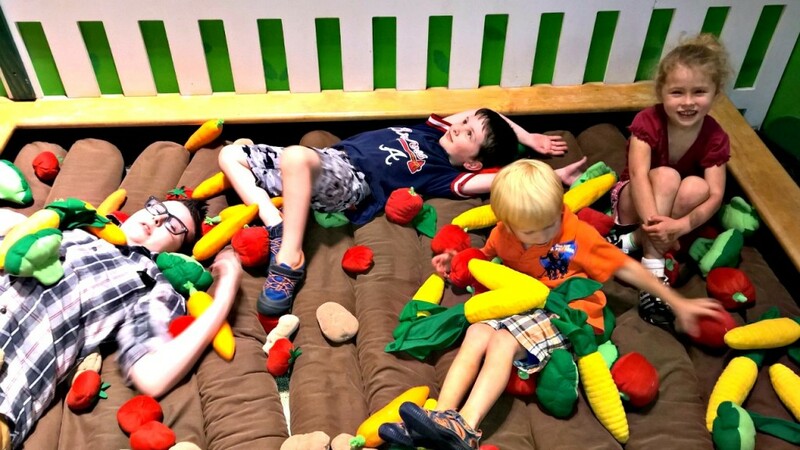 We ended the day with everyone dog-piling into the garden and tossing stuffed vegetables at one another. I think Jonah is daydreaming about when he’ll get to come back again.